The Huawei Mate 10 was announced in the shadows of the Mate 10 Pro. It sports a lower price, beefier design, no waterproofing and no OLED screen. As a result, it’s in danger of being dismissed as the inferior, forgettable sibling. Huawei hasn’t helped this by releasing the Mate 10 only in select markets, while the flagship Huawei Mate 10 Pro is more widely available – even in the US starting on February 18. For many users though, the Mate 10 could be the better choice. In fact, for a certain type of user, it could be the best smartphone currently on the market. A bold claim, but hear us out. The Mate 10 has the same camera as that found on the Mate 10 Pro, a very competent snapper with f/1.6 lenses. It also features the brand new Kirin 970 chipset, loaded up with cutting-edge components. Add to that mix a 4,000mAh battery, an all-important 3.5mm headphone jack and a microSD card slot – both the latter missing in the Pro variant - and the appeal of the vanilla Mate 10 fast becomes self-evident. It also stacks up very well alongside the non-Huawei competition. It has virtually the same storage, resolution and RAM configurations as the Samsung Galaxy S8 and Galaxy S8 Plus, as well as the LG V30. The glass back and metal frame also give it a design-edge over pricier devices like the Google Pixel 2 and Pixel 2 XL, while the price undercuts all the main competition, apart from the OnePlus 5. 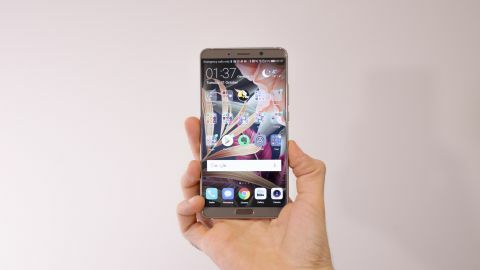 Add to that a pre-loaded screen protector and a soft touch case in the box and in addition to being a spec-beast, the AU$899 (around $710, £530) Huawei Mate 10 is also a reasonably priced offering given the current flagship climate – on paper at least. Update: Deciding between Huawei and Honor's latest phones just got a bit tougher with the launch of the Honor View 10. It features the latest internals found in the Huawei Mate 10 and Mate 10 Pro, like the Kirin 970 and 6GB of RAM, but comes in £449 (around $600/AU$775, though may be less when it arrives). There are certainly sacrifices made for the lower price point, like a build that's less premium and cameras that can't see into the darkness as well. But given that the Mate 10 isn't available in many regions, the View 10 is worth checking out, that is, unless opting for the Mate 10 Pro is more your style. Confirmed for Australia, China, Egypt, Malaysia, Mexico, New Zealand, Philippines, Saudi Arabia, Singapore, Spain, UAE and other select markets, despite being widely available, the Mate 10 doesn’t look set to launch in the UK or US just yet. Costing AU$899 (around $710, £530) SIM free, the Mate 10 will be available in Australia from November 15, with availability for Vodafone AU and JB Hi-Fi confirmed. Better than the Mate 9? The Huawei Mate 10 is the true successor to the Mate 9. It has the same size screen and virtually identical proportions. Upping the ante, it upgrades the build from all-metal to a combination of glass and metal, resulting in a more premium fit and finish. The Mate 10 also increases the screen resolution from Full HD to QHD, while retaining the same 5.9-inch 16:9 screen-size and aspect ratio, resulting in a much sharper display. The camera is also improved here, with f/1.6 apertures across both dual rear lenses. Huawei has integrated AI components into its camera UI, with a smart scene detection that, it claims, gets to know how you shoot and fine-tunes results accordingly. The Mate 10 and Mate 10 Pro also ship with the latest version of Android, Android 8, complete with EMUI 8, Huawei’s custom interface. This also outputs to a TV or monitor to create EMUI desktop, a Samsung DeX/Microsoft Continuum-style experience that supports full keyboard and mouse input. Round the key feature list off with a 4,000mAh battery, IR blaster for TV remote control functionality, 64GB of storage and a microSD card slot, and the Mate 10 spec-list reads very well indeed. The new trend of metal frames and glass fronted and backed bodies has made its way onto the Huawei Mate series, and the Mate 10 is an excellent example of this design done right. The front is all about that screen, with an impressive 81.6% screen-to-body ratio. Below the screen sits a fingerprint scanner, above it, a front camera and speaker, while to the right are all the buttons. These protrude nicely and offer excellent, click tactility so you know exactly when you’ve pressed one. At the base is the bottom firing speaker and USB-C port, while up at the top is a 3.5mm headphone port and IR blaster. The headphone port is one area the Huawei Mate 10 will edge ahead for many over the Mate 10 Pro, Google Pixel 2 XL and iPhone 8 Plus. Unlike the aforementioned, the Mate 10 also features a microSD card slot for expandable storage. Around the back of the Mate 10 there's a sheet of Gorilla Glass. This is curved across both axis, so the phone feels comfortable in the hand, despite its size. It also delivers a decent amount of grip and looks exceptionally slick in the process. Unsurprisingly, it does attract fingerprints readily, especially in the darker variants, so if you want to keep grubby marks at bay, use the soft touch case that ships in the box. The Mate 10 also comes pre-fitted with a screen protector, so Huawei makes sure from the get go, you won’t need to invest extra in accessories to keep your phone free of scuffs. There's no real waterproofing or water resistance here, so the Mate 10 won't withstand a dunk, however the IP53 splash-proof rating means use in light rain and an occasional spillage nearby won't render it a shiny, pricey brick. As for the screen, it's a 5.9-inch QHD IPS LCD panel. 5.9 inches may sound smaller than the Mate 10 Pro's 6 inches of screen, but given the Mate 10's more traditional, 16:9 aspect ratio, this is actually a bigger phone with a bigger display from a surface area point of view. As a result, you get more screen here than you do on the Mate 10 Pro and other 6-inch 18:9 devices like the Pixel 2 XL and LG V30. The IPS screen technology on the Mate 10 is loaded up with support for HDR10, delivering punchy colours and greater dynamic range when watching supported content. Despite looking great in isolation, quality can’t compete with the likes of the Samsung Galaxy Note 8 and Mate 10 Pro with their OLED technology. Despite this, viewing angles are very good and it all gets extremely bright – up to 730 nits.